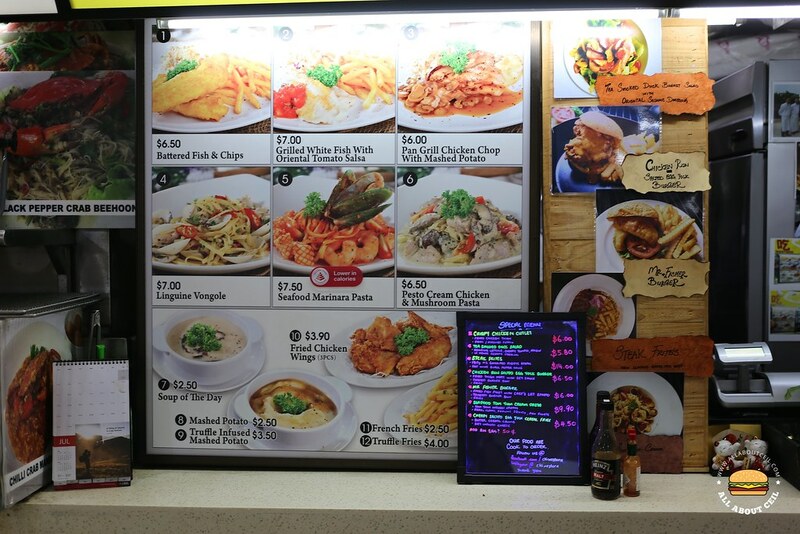 It was a rainy evening when I came by this coffee shop to try this western food stall for the first time. I came across their Facebook page and was amazed by the number of 5-stars reviews given, there was a total of 47 such reviews, and that prompted me to visit it. 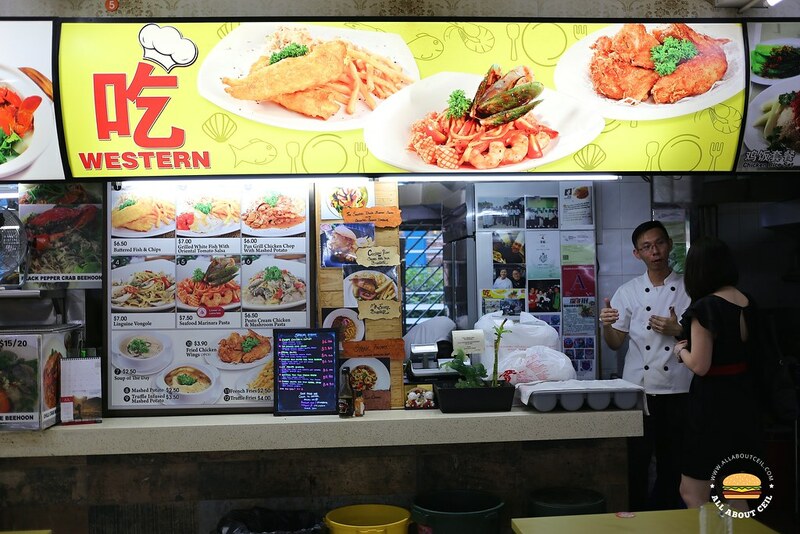 This stall is helmed by 3 experienced chefs with more than 2 decades of experiences working in top-class restaurants and hotels as mentioned on their Facebook page. Their aim is to provide quality western meals at affordable prices, their menu is range from fusion creations to classic homely dishes. They have been around since 15 February 2016. 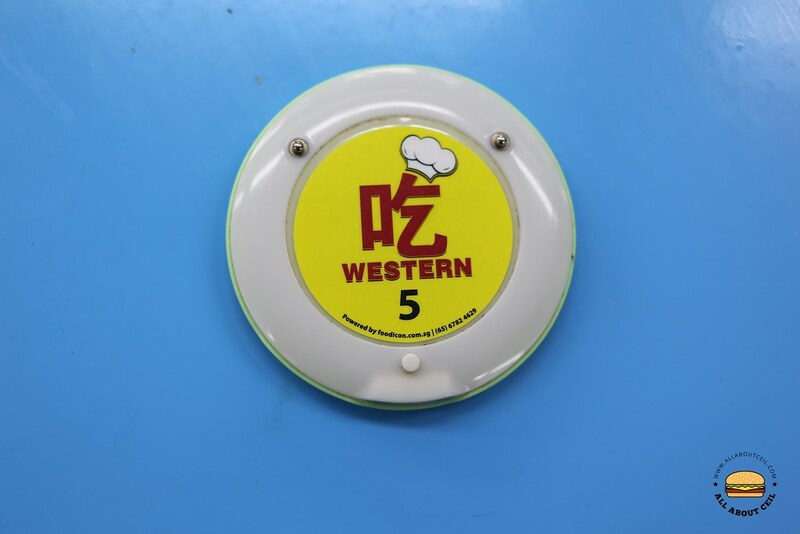 They named the stall as "吃 Western," it literally means "Eat Western" as "吃" means "eat" in English. I decided to go with the pan-grilled Chicken Chop with Mashed Potato ($6.00) and Chicken Run Salted Egg Yolk Burger ($6.50). I was given a pager after the payment. I waited for about 15 minutes before it buzzed. I went to the counter, returned the pager and was only given the burger. I asked, "I should have another order." He checked the order chit before handed the other dish to me. 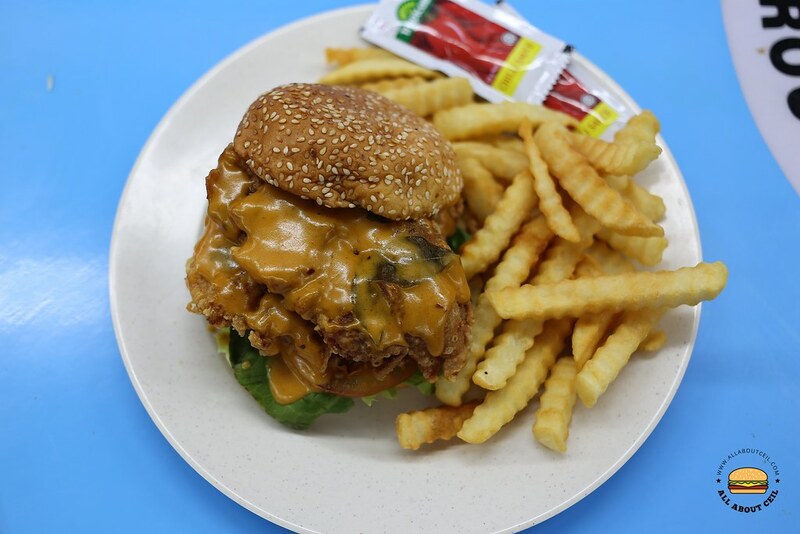 Chicken Run Salted Egg Yolk Burger ($6.50) consists of 2 pieces of fried chicken as patties, served with tomato and lettuce then garnished with salted egg sauce together with crinkle-cut fries. Those sesame buns seemed to be those of generic brands that are available conveniently. The salted egg sauce did not taste like those that are made from the salted egg yolks but rather those from the powder with just a slight salted egg flavor which I did not like it. I would think those crinkle-cut fries are a boring option for a side dish, but the serving was quite generous though. 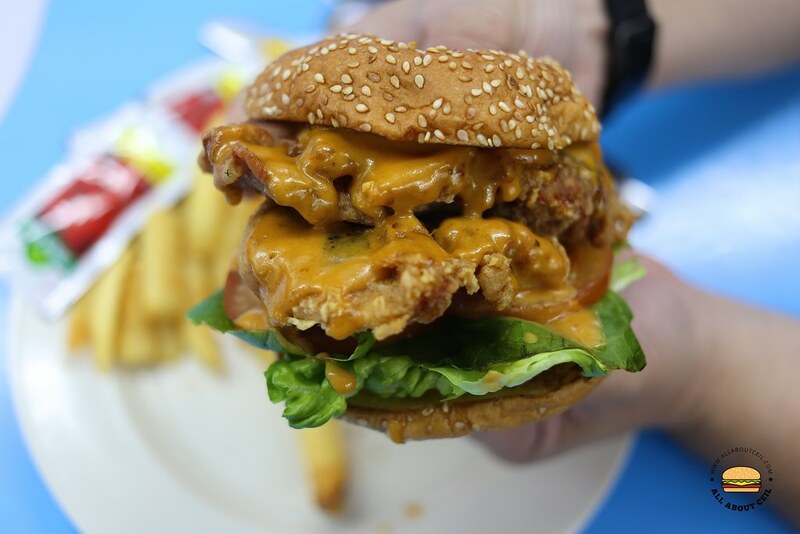 The fried chicken patties were principally forgettable as it was mildly flavored. 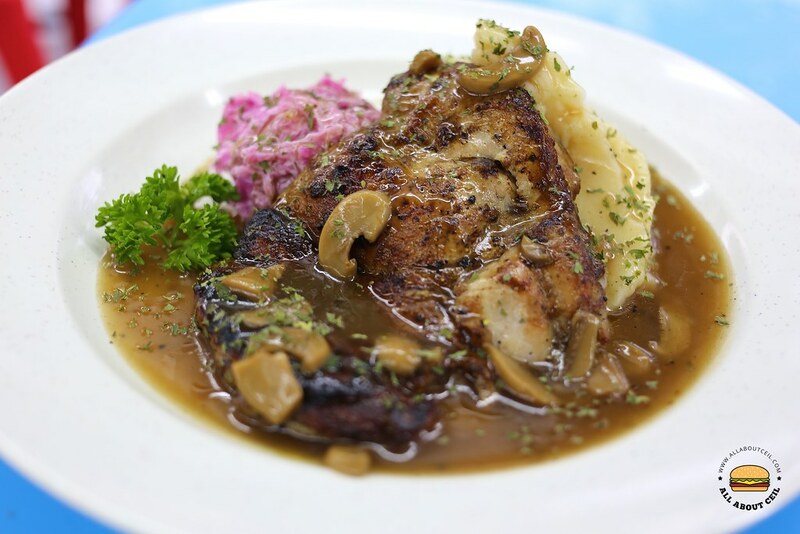 Chicken Chop with Mashed Potato ($6.00) which consists of a piece of nicely charred pan-grilled chicken with mashed potato and coleslaw, served with mushroom sauce. Maybe I have left it for a little too long after spending some time taking pictures as the chicken did not taste as crispy as it seemed. I did not like it as much as compared to the chicken chop at The Carving Board, which is my current favorite. 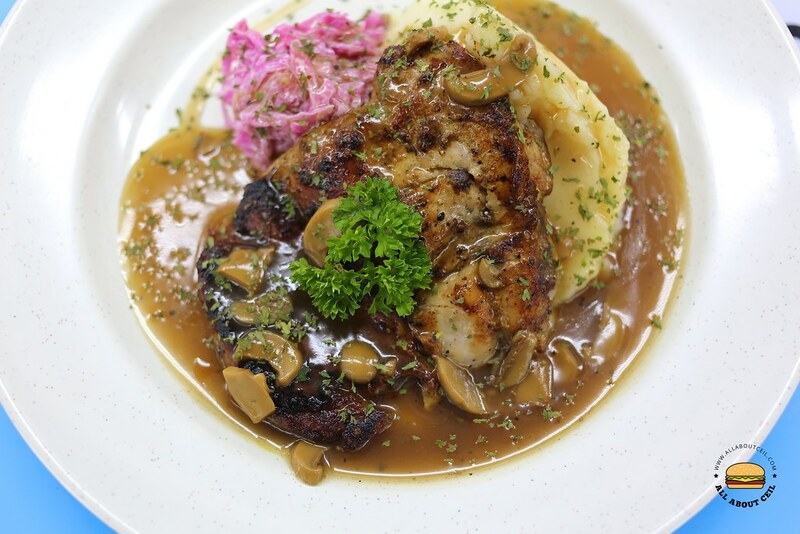 The mashed potato did not have much flavor if omitting the mushroom sauce but its texture was rather smooth though. The coleslaw made exclusively with purple cabbage, which was pretty decent. Overall, it was not too bad, it was just simply disappointing, but I ate it anyway. I am not all impressed by these dishes, or perhaps I am expecting too much thus feeling the disappointment? Soup was sold out. I ordered 3 mains and 1 side to share with my wife and children. When I asked for side plate for the children, they said don't have. When I pointed at the stack of soup bowls, he said cannot because he needs to use....But isn't soup sold out? Bad service...not family friendly .